Brainwashed - Rudolf Eb.er, "Om Kult - Ritual Practice of Conscious Dying, Vol. 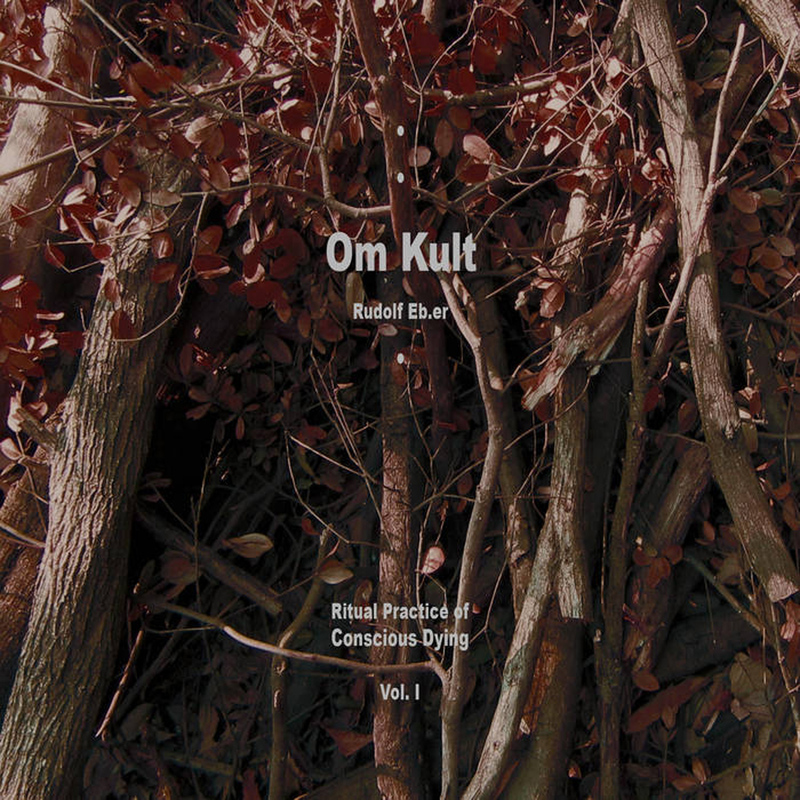 1"
Rudolf Eb.er, "Om Kult - Ritual Practice of Conscious Dying, Vol. 1"
I have never been all that deeply immersed in the international noise scene, but I have certainly been aware of the scatological insanity of Rudolf Eb.er for a couple of decades now. I always viewed his work like an anarcho-punk might have viewed GG Allin: a compelling spectacle, for sure, but in a completely different category than the serious music that truly mattered. After hearing this singular and bizarrely brilliant mélange of "psychomagick spells and occult yogic instructions," however, I definitely need to go back and cautiously revisit more of Eb.er's previous ouevre: he clearly grasps something elusive and profound that most other people do not. This release may be the birth of a transcendent and entirely new phase, however, as Eb.er has allegedly "conquered the nether scatological regions" and moved onto "psycho-spiritual cleansing rituals." As a listener, I did not feel particularly psychically cleansed by this album, but I did not feel coated in filth afterwards either, which is an unexpected step in the right direction. With Om Kult, Rudolf Eb.er seems to have emerged from the grotesque purification ritual of his previous work as some kind of wild-eyed and uncomfortably intense shaman operating at an unusually high plane of consciousness. This is the first part of a planned trilogy that is apparently a continuation of Brainnectar's "studies of psycho-spiritual forces." There seems to be quite a lot of conceptual and philosophical background to this release, which makes a lot of sense, as I suspect someone can only get to this place through a combination of intense thought and an even more intense desire to transcend consciousness entirely. That latter has always been a driving force for Eb.er, as his work has historically tended to have a very primal and physical component. That drive manifests itself in a compellingly different way on Om Kult though, as these 31 fragments manage to mingle a meditative feel with a strikingly animalistic and guttural sensibility. Those two threads normally could not easily coexist, but Eb.er's approach to Zen lies more in the acceptance that he will inevitably die, rot, and be reabsorbed by the earth than in imagining a peaceful stream or feeling any sense of oneness with his fellow man. While I definitely appreciate where Eb.er is coming from conceptually and artistically, the world is littered with underwhelming albums birthed from interesting ideas. Fortunately, this is not one of those albums, as Eb.er's approach to composition was every bit as ingenious and unconventional as his inspirations. Much like Graham Lambkin, Eb.er proves himself to be the kind of artist that can create something truly bizarre and memorably disturbing with only a microphone or a crappy tape recorder. Being able to make a complex and absorbing album from virtually nothing is undeniably an impressive feat, but it is also something much than that: in reducing his palette to just his voice and some field recordings, Eb.er eliminates any artifice that might have blunted the raw, direct connection of these pieces. The sole concession made to conventional musicality is the occasional use of a sine wave generator, which Eb.er generally uses to create a shifting and uneasy backdrop of subtly menacing drones at uncomfortably close frequencies. At other times, however, the sine waves sound like an emergency broadcast tone emanating from a living room television as the room's occupants are being messily and loudly devoured by blood-thirsty demons. The album's latter half is especially rife with such viscerally nightmarish moments, particularly "Hexenerscheinung," "Beelzefest," and "Schmerzmasse abfaulend," which seem to form an infernal triptych of shrieking women, crackling fires, demonically pitch-shifted voices, and shuddering machinery. All three resemble a troublingly realistic field recording of hell opening up to engulf a small village in fiery, murderous chaos. If the album was entirely in that vein, it would be quite a grueling and unpleasant experience, but Om Kult has such a thoughtful and deliberate arc that such moments actually feel earned and cathartic by the time they arrive. The majority of the album resembles a slow-building and phantasmagoric series of vividly textured abstract vignettes built from tape hiss, chittering insects, rusted industrial machinery, falling water, and recognizably distressed and cryptic snatches of voices. Of course, those are just the bits that I can recognize–there countless additional touches that will either lurk just outside my consciousness forever or only reveal themselves with time and deeper listening. Eb.er apparently spent two years accumulating and processing the sounds for this album, wandering Japan's forests, fields, and monasteries and recording everything from chanting monks to maggots feeding on dead animals. Also: dirt and haystacks. I have no idea how much some of those sounds actually provide a noticeable element in the final collages, but I certainly appreciate how deeply committed Eb.er was to earthy authenticity and the darker realities of matter and life. I could not hope for a more complete or thematically coherent celebration of ephemerality and decay. By any standard, Om Kult is a remarkably intense, memorable, unnerving, and one-of-a-kind album. I definitely would not describe it is significantly more accessible than Eb.er's usual confrontational and polarizing artistry, yet it is unquestionably a tour de force of…something. Whatever is happening here feels meaningful and important and like great art. If it is not, it is at least one hell of a convincing illusion. I think I might have just become a rabid Rudolf Eb.er fan. No one else will release anything even remotely as outré or timelessly otherworldly as Om Kult this year. Or possibly for several years to come.